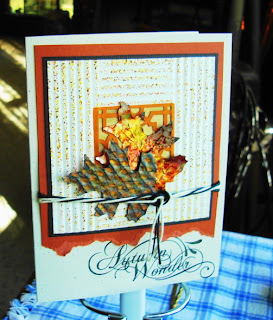 Vada's Blog Stamp Inks and Paper : Autumn Wonder. Keeping in the “Crimper Theme” at Gingersnaps I made a fun “Q & E” card. I crimped the outside cream panel in two directions and tapped with my DOT’S Stoneware Texture stamp with distress inks. The Oka Leaves are done, one was crimped and one was inked with alcohol inks on a pop can. The center was punched with a Martha Stewart punch. Autumn Wonder stamp is from TAC. Wow! This is so pretty! I love it! You are a crimping genius! Love the highlighted areas and the Fall leaves are very pretty! Hope you have a lovely weekend! 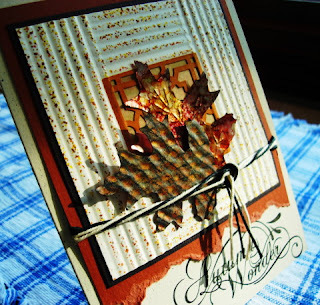 Great card Vada - love how you have done the aumtumn leaves! These are quite beautiful! I love the texture! The crimper created texture that is so appropriate for the leaves.